Launched on Wednesday, the Powerbeats Pro are Bluetooth earphones that clip around the ear using earhooks, allowing them to be worn more securely while the user is in motion. As well as being designed for an active lifestyle, the Powerbeats Pro also offer sweat and water resistance, are reinforced to stand up to the rigors of usage, and are smaller and lighter than their predecessor. Both earpieces offer identical physical volume and track controls, with long and short-range optical sensors automatically playing and pausing music and dealing with call handling, simply by wearing or removing each earpiece. There is no power button, but the earphones are able to automatically enter a sleep mode if the motion detection system believes they are left alone or idling and not worn. Taking advantage of the same H1 chip used in AirPods, the Powerbeats Pro boast superior cross-body Bluetooth performance, pairing by opening up the carrying case, and support for "Hey Siri" vocal prompts with Apple's digital assistant. 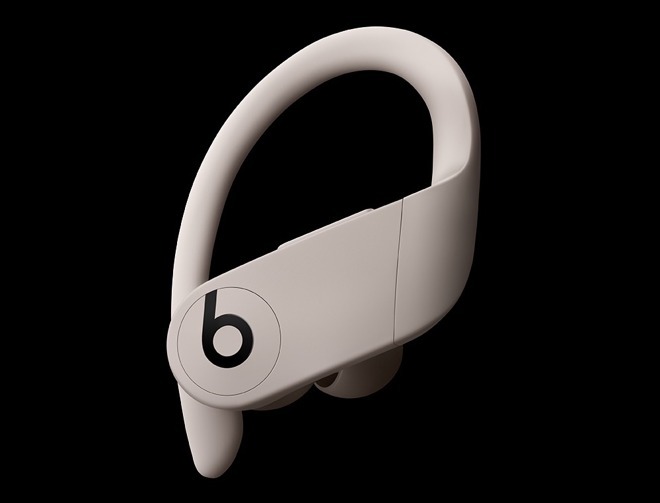 Battery life for the Powerbeats Pro is claimed to be up to nine hours per earbud, and more than 24 hours of combined playback when using the built-in battery of the magnetic closure case, used to recharge the earphones. The fast-charging "Fast Fuel" facility means users will be able to get an hour and a half of usages after just five minutes of charging, and up to 4.5 hours of usage after 15 minutes of charging. While AirPods benefit from the wireless charging case, Beats has opted to use a cable to recharge the case itself, and supplies a Lightning-to-USB-A cable in the box. Also included are four pairs of eartips in a variety of sizes, allowing the accessories to better fit the user's ear canal. Shipping in May in the United States and 20 other countries, the Powerbeats Pro will be offered in Black, Ivory, Moss, and Navy color options, priced at $249.95. Aside from the US, the initial launch list of countries includes Australia, Austria, Belgium, Canada, Denmark, Finland, France, Germany, Greece, Hong Kong, Ireland, Italy, Japan, Lichtenstein, Luxembourg, Macau, Netherlands, New Zealand, Norway, Portugal, Puerto Rico, Singapore, Spain, Sweden, Switzerland and the UK. More countries and regions will see launches of the accessory in the summer or fall.